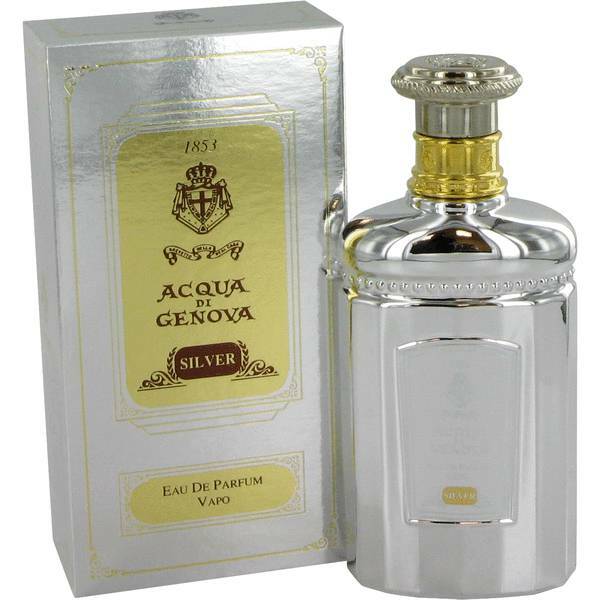 Acqua Di Genova Silver Perfume by Acqua Di Genova, Acqua di Genova Silver by Acqua di Genova is an excellent blend of both woody and fruity fragrances that come together to shape a perfectly delightful perfume. At its heart, this fragrance is a bouquet of flowers, exhibiting Turkish rose, violet, calming lavender and geranium. These flowers are complemented in the bottom notes with the sharp smells of musk and sandalwood. Finishing the perfume off at the top notes are the green, fruity scents Read More Read More of pear, green apple, berries and bergamot. This fragrance house was founded by Stefano Frecceri in 1853 in Italy, soon becoming a favorite among those who wanted to smell good with quality ingredients. Still based in Italy, Acqua di Genova is a niche company that recently celebrated 150 years of being in business by introducing two new fragrance lines– “Gold and Silver” and “1853.” The company is proud to continue to use original recipes from when they first opened their doors. All products are original, authentic name brands. We do not sell knockoffs or imitations.